Designer of the Antwerp 6, Dries Van Noten, presented a new colorway for this shoe. 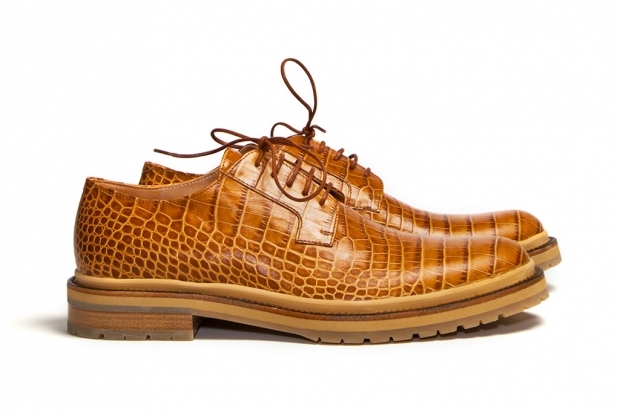 Rust-colored, structured full-leather upper resembling a crocodile upper. Sitting atop a leather and rubber sole, these shoes also boast a leather-lined interior as well as waxed laces. This is not a Derby Shoe you will see at Johnson and Murphy or Macys! Made in Italy, these shoes don’t come cheap but you can expect excellent construction which should last for a long time! Clearly an investment piece on a staple with an exotic twist! cop them here! This entry was posted in Fashion (Chic) and tagged derby shoe, Dries Van Noten, Fashion, footwear by Wu-chicDO. Bookmark the permalink.